Of the organ the Church document Sacrosanctum Concilium says “..the pipe organ is to be held in high esteem, for it is the traditional musical instrument which adds a wonderful splendour to the Church’s ceremonies and powerfully lifts up man’s mind to God and to higher things.” It was in the spirit of the above that our community decided to commission a new organ to replace an instrument which had reached the end of its useful life. My hope is that this instrument will both serve the liturgical needs of the parish and, at the same time help encourage others in our community now and into the future to develop their artistic skills to the utmost. I must record here the commitment of all our instrumentalists and singers but particularly today that of our organists; our Parish Organist, Roderick Sime and our other regular organists, John Tetlow, Edward Walsh and Daren Lane. 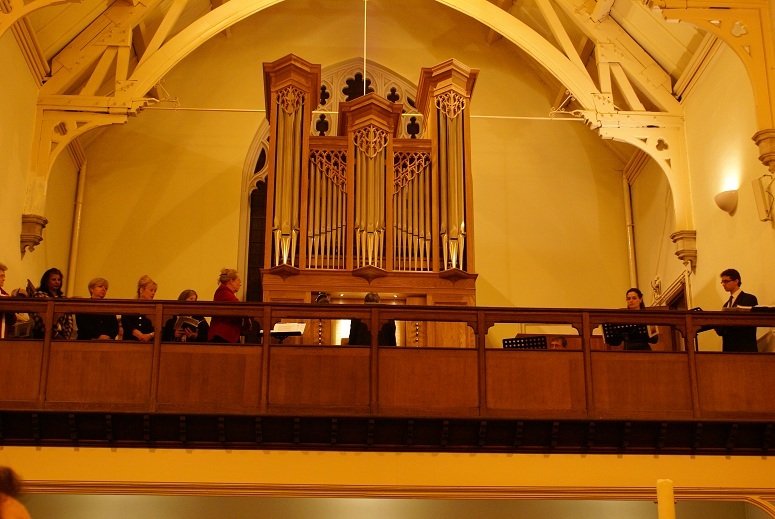 I thank and congratulate all those involved in this project, above all, Robin Jennings, the organ builder and his team including David Frostick who voiced the instrument and Geoffrey MacMahon the designer. We have also been greatly supported by Andrew Wright, our Diocesan Master of Music with not only his expertise but also his enthusiasm. Following training at The London College of Furniture and the London Organ Builders N.P. Mander Ltd, Robin has had his own business since 1989. He is married, with 2 children. He has become one of the few makers in Europe specialising in custom built chamber organs and is currently based in Dorset, England. Previous commissions include instruments for St Pauls Cathedral, The Temple Church, La Scala, Milan, Sir John Eliot Gardner The Royal Scottish Academy of Music and Drama, and the Academy of Performing Arts, Hong Kong. 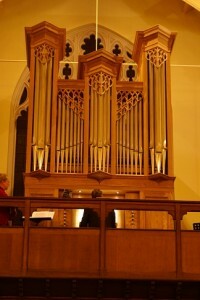 The organ for Our Lady of Lourdes in Wanstead is his largest instrument as yet with 18 stops. Robin says that the instrument has been a triumph of teamwork: David Frostick who has been involved in the project from the very beginning is a well known organ advisor and leading international voicer specialising in English reeds carried out the voicing of the organ and Geoffrey MacMahon, the design work. All three involved had previously worked together at Manders. It was in the spirit of the above that our community decided to commission a new organ to replace an instrument which had reached the end of its useful life. The instrument was installed in December 2010 and our hope is that this instrument will both serve the liturgical needs of the parish and, at the same time help encourage others in our community now and into the future to develop their artistic skills to the utmost. Following training at The London College of Furniture and the London Organ Builders N.P. Mander Ltd, Robin has had his own business since 1989. He is married, with 2 children. He has become one of the few makers in Europe specialising in custom built chamber organs and is currently based inDorset,England. Previous commissions include instruments for St Pauls Cathedral, The Temple Church, La Scala,Milan, Sir John Eliot Gardner The Royal Scottish Academy of Music and Drama, and theAcademy ofPerforming Arts,Hong Kong.